What is the difference between tendons and ligaments? Tendons connect muscle to bone and can withstand tension. stabilizes joints and helps prevent excess movement. What types of tears need surgery and which have the potential to heal with PRP or Stem Cell Therapy? Partial tendon or ligament tear – Only part of the tendon or ligament is torn. These injuries do very well with a platelet-rich plasma injection (PRP) placed directly into the injured area using image guidance. Complete non-retracted tendon or ligament tear – Although this sounds like a surgical emergency, it doesn’t necessarily mean that the tendon or ligament is completely torn in half, retracted back and not connected at any point. Many times, this tear has complete tears within the long fibers but may still be intact. This means the structure is still holding itself together. These injuries typically do very well with an injection of stem cells at the injured area using precise image guidance. Complete retracted or “ruptured” tendon or ligament – When this occurs the tendon or ligament completely ruptures and both ends are completely retracted back. This injury requires surgery. 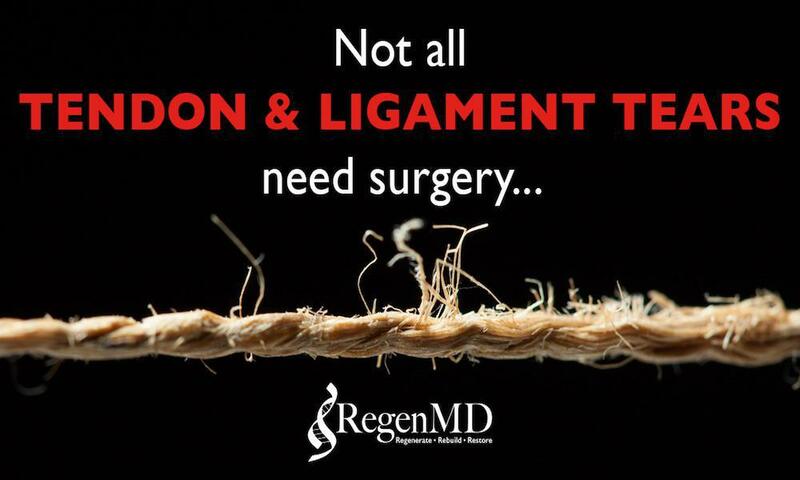 Contact the experts here at RegenMD to see which options would be best for you. If you’re not a candidate for regenerative medicine procedures, our board-certified surgeons offer a full spectrum of the traditional orthopedic solutions, plus physical therapy – all on site!